Bose speakers are best in class and Bose SoundLink Revolve is just an amazing addition to Bose speakers. It purely plays on sound so if you are a music lover, this speaker will simply blow your mind. It’s a great choice for those looking for immersive sound clarity. The true 360-degree sound lets you enjoy loud music in any kind of setup. So, you can play your music loud and clear at a party or any outdoor place. The only issue with this speaker is that it is not waterproof and stain-proof. So, you have to be careful with its use. Bose SoundLink Revolve speaker is stylish in design and great in looks. The speaker has an amazing mid range and that makes it a popular choice amongst the young generation. In fact, you can buy this speaker for its treble and bass performance. The battery performance of the speaker is great but not exceptional. It gives you up to 12 hours of playback time on a one-time charge. The price might seem unrealistic compared to featured competitors such as the Ultimate Ears Wonderboom. There are speakers that provide with 16 hours of battery too in a similar range. So, battery performance can disappoint at times. The connectivity of the speaker is good, especially in the wireless range. The speaker lets you pair two devices at a time, which is again great. The 360-degree sound performance has caught up with time. If you also want to experience a similar feature in sound performance, then this speaker is apt for you. The music sounds similar in every setup or environment. It’s kind of an omnidirectional-audio act that you will surely enjoy. Bose SoundLink Revolve has water resistant (Ipx4) guard so it’s not completely waterproof and dust proof. In fact, you will be disappointed if you buy this speaker for its waterproof feature. If you kind of enjoy app integration, then you must buy this speaker. It integrates with an app to give you an amazing setup. You can control all the features of the speaker through the app. Also, it lets you connect with two devices at a time. You can play your music loud and clear with this type of connectivity. The speaker has a stereo and party mode. You can play it loud with the party mode so it’s perfect for your house parties. The stereo mode is perfect for lounging or hanging out with your friends. Of course Bose SoundLink faces tough competition from JBL Charge 2+ and JBL Pulse 2. There are many great features of the Bose SoundLink Revolve speaker, let us look at some of them. Bose SoundLink Revolve speaker has deafening and immersive sound, with true 360-degree coverage. You can hear your music loud and clear in any setup or any environment. The speaker features a highly efficient transducer with dual passive radiators that give you omnidirectional acoustic sound. The performance is superlative and you will surely enjoy it playing it loud. The speaker has a seamless aluminum body that has a water-resistant IPx4 feature. Though it’s not completely waterproof and dustproof, still it’s durable to carry it along with you while traveling. The battery can be recharged and it plays up to 12 hours of nonstop music on a full charge. Bose SoundLink Revolve speaker has a great wireless Bluetooth connectivity. You can connect and pair the speaker with many different devices. In fact, it lets you connect to any two Soundlink devices to give you an amazing sound quality. You can also pair two speakers for party or stereo playback. The speaker connects to Bose connect app with instinctive drag-and-drop clear interface, the app also lets you easily switch between two Bluetooth devices. You can also change your music settings with the help of Bose app connect. The grip and go design is simply amazing. The speaker is truly grabbable and easy to operate. You can switch to right down to smooth buttons that ensure every interface feels natural. It is made from soft materials that make it look ultra stylish. The speaker lets you press and hold the unique multi-function button so you can access the voice input for your phone’s Siri or Google Assistant. This actually saves a lot of time too. Bose SoundLink Revolve speaker comes with a charging cradle that lets you charge your speaker while you listen to your music. It’s also available with wall charger option. Bose SoundLink Revolve lets you take all your calls right through the speaker. It features a speakerphone option. Wireless range of the speaker is up to 9 m (30 ft), but it also depends on the place you play it along. The speaker is bulky in looks but its light in weight. The style of this speaker truly stands out and makes it popular as compared to other speakers that are available in this range. The aluminum enclosure wraps around the speaker giving it a seamless look. It has rounded base with all the controls on the top. Bluetooth, aux, volume and multifunctional control features on the top. The build quality of the speaker is sturdy as it features IPX4 water resistant. You can use the speaker outdoors without any problem. It’s also big and sturdy and even if you drop it, there won’t be any kind of issue with the sound quality of the speaker. 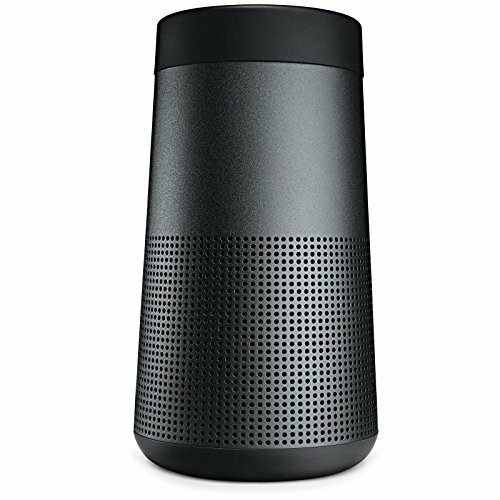 Bose SoundLink Revolve has a balanced tonal sound performance. The low-frequency range of the speaker is good. The midrange in bass and treble is also good if you compare it with previous speakers of Bose. The 360-degree sound is impressive and the high range is great. Even if you hear the music on full volume, there is no distortion in the sound quality. The sound maintains composure at any frequency. The best part about the speaker is that it gives you the same audio output in any setup. Overall, the sound quality of the speaker is exceptional. The setup of Bose SoundLink Revolve speaker is simple and there are no issues with connectivity or software. The interface of the speaker is clean and it features all the control options at the top. The buttons let you switch between two different speakers at a time. A LED light indicates the connection you make or when you pair with other devices. There is a power button on the speaker that tells you about the battery left. This is actually a great feature for the price it offers. When the battery runs low, you will get an indication of the same. The multifunction button can also help to switch between your music choices. The sound of the speaker is immersive and good. It provides 360-degree coverage in stereo and party mode. The speaker lets you connect to two different devices so that you can play your music loud and clear. There is no issue in audio performance and it’s pretty smooth. The wireless range of the speaker is also good according to price. The speaker is compatible with all the Bluetooth devices. You can easily connect and pair the speaker with any wireless Bluetooth device. It also features a voice prompt for your easy access. It’s compatible with Siri and Google now both. The charging cradle present in Bose SoundLink Mini II is ironically not included with Bose SoundLink Revolve. Bose SoundLink Revolve speaker gives up to 12 hours of battery life once you fully charge it. The battery performance is not that great if you compare it with other speakers in this range. But, still it’s good for the amazing features and price it offers. You can play your music nonstop for up to ten hours with full charge. It takes about 4 hours to charge, which can be time-consuming. The connectivity is great and there is no issue. You can connect the speaker with any Bluetooth device. It can also connect to other soundlink devices so that you can play your music loudly. Dynamics of the speaker are good. Great treble and mid range. It has a lean bass base. The battery can drain quickly. Bose SoundLink Revolve speaker is totally worth your money. It delivers exceptional and sharp sound performance. The midrange and low range of the speaker are also good. The effective 360-degree sound is immersive and lets you enjoy your music in any setup. The speaker is stylish in looks and weatherproof too. It just suffers in the battery department but 12 hours of playback time is actually good for the price. It’s portable so you can carry it along while traveling too. It gives a solid punch in music, so you will surely be happy with its audio quality. If you are a true music lover, then you should not miss this one. It’s a great choice for your music listening for sure.